A History Timeline of Stanley Works and Stanley Rule & Level, gathered from multiple sources, knowledge bases and collector information. I will add information as I find it. If you know of a merger or aquisition, let me know. Current refences list at the botom. 1826 Frederick T. Stanley returns to New Britian, CT.
1854 STANLEY begins to manufacture boxwood rules. 1857 Henry Stanley starts The Stanley Rule & Level Company. Organized as a joint stock company in 1857, Stanley Rule & Level was the result of bringing together the New Britain companies of Hall & Knapp (manufacturers of plumbs, levels and squares; incorporated 1853) and the A. Stanley Company (established in 1854 to manufacture rules). 1857 STANLEY begins manufacturing levels. 1863 STANLEY introduces hammers to their line up. 1863 Stanley Rule & Level Company purchases E.A Stearns & Co of Brattleboro VT.
1869 Stanley Purchased Bailey, Chaney and Company and acquired the right to manufacture tools under Bailey’s patents. 1869 Stanley purchases Leonard Bailey patents and machinery. 1884 William H. Hart begins long stint as company president. 1884 Stanley purchases the Reed& Prince tack Manufacturing Co.
1870 STANLEY began manufacturing screwdrivers. 1870 STANLEY began manufacturing metallic hand planes. 1871 Millers Patent is introduced. 1875 Miter Boxes added to the Stanley line. 1898 The corragated plane is introduced. 1899 Staley buys the Bridgewater Iron Co.
1904 Stanley purchases The Hurley & Wood Co.
1914 Stanley purchases Canada Steel Goods Co.
1914 wood and cold chisels and punches introduced. 1916 Stanley purchases The Eagle Square Co of South Shaftsbury VT.
1918 Stanley purchases The Crescent Works, a hinge manufacturing plant in Japan. 1919 Stanley Rule & Level Company buys out Gage Tool Co.
1920 Stanley Works acquires The Stanley Rule & Level Company. 1920 Stanley buys the Union Plane division. 1920 The new SW (sweatheart) logo is introduced to symbolize the merger of the STANLEY Rule & Level Company and the STANLEY Works. This was used on hand plane untill 1935. 1922 The Bailey #5 1/4 is introduced. 1924 The first “Four Square” was introduced. These were dropped and resurected in 1934. 1925 Stanley introduces their steel plane line. The “S” models. 1931 STANLEY introduces the first steel tape rule. 1936 STANLEY introduces utility knives in 1936. 1937 Stanley Works entered the UK market with the acquisition of J.A Chapman of Sheffield, England. ——–If you are looking for an Made in England Stanley Plane study, try here. 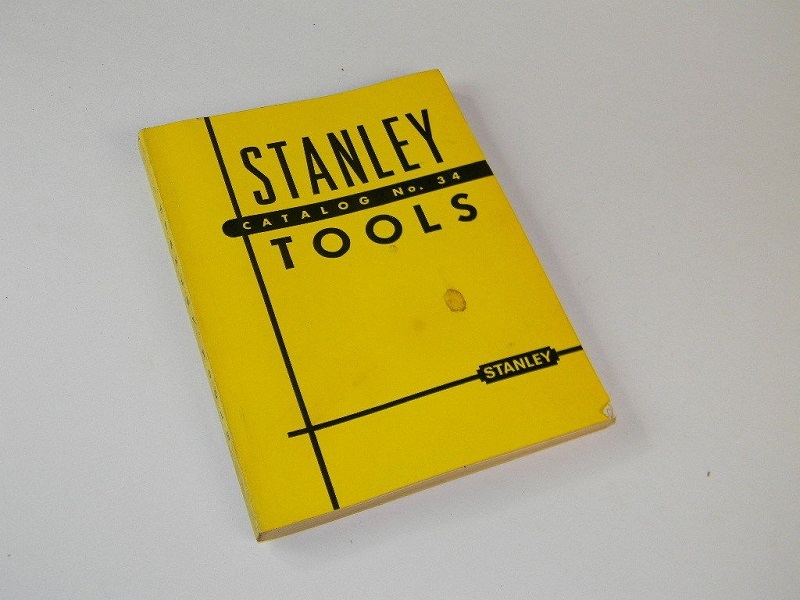 1937 Stanley Works renames “The Stanley Rule & Level Company” to The Stanley Tools Division. 1941 The Two Tone Planes introduced. 1944 Stanley purchases the Russell Jennings Manufacturing Co, of Chester CT.
1946 Stanley Works acquired North Brothers Manufacturing Company. 1957 Stanley intrduces the first Handyman plane. Others are intorduced in 1964. 1963 STANLEY builds the largest hand tool plant in the world in New Britain, CT. The same year, we introduced the PowerLock Tape Rule. 1963 Stanley started operations in Australia as Stanley-Titan when it bought a 50% share of Titan, a subsidiary of BHP. 1966 Stanley Works acquired Vidmar Cabinets. 1969 The PowerLock® Tape Rule represented Stanley as part of Apollo 11’s Lunar Landing Gear. 1970 Stanley-Titan acquired Turner Tools based in Melbourne, Australia. 1980 Stanley Works acquired Mac Tools. 1983 Stanley purchases Taylor Rental Corp.
1984 Stanley Works purchased Proto from Ingersoll Rand and it becomes Stanley Proto. 1986 Stanley Works acquired Bostitch from Textron. 1990 Stanley Works acquired Goldblatt and ZAG Industries. 1990 Acquired Sidchrome Tool Co., headquartered in Melbourne, Australia; closed plant and moved all tool manufacturing to China. 1992 Stanley Works purchased the Chatsworth, California-based Monarch Mirror Door Co. Inc., an American manufacturer of sliding and folding mirror-doors. 1999 STANLEY introduces the FatMax® Tape Rule and the FatMax Anti-Vibe® Hammer. 2000 Stanley Works acquired Blick of Swindon, England, a UK integrator of security solutions, communication, and time-management solutions, and CST Berger. 2002 Stanley acquires Best Lock Corporation, doing business as Best Access Systems. 2002 In October, Stanley Works acquired Best Access Systems of Indianapolis, Indiana, for $310 million. The acquisition also prompted the creation of a new Access Controls Group for Stanley. Further additions to this new working group included Blick. 2004 In January, Stanley announced plans to acquire Frisco Bay Industries Ltd., a Canadian provider of security integration services, for $45.3 million. In December, the acquisition of ISR Solutions, Inc., headquartered in Washington, D.C., was announced. ISR Solutions provides the U.S. federal government and commercial customers with access security system services. 2005 In January, the acquisition of Security Group, Inc. was announced. Security Group was composed of two primary operating companies Sargent & Greenleaf, Inc., a manufacturer of locks; and Safemasters, a North American provider of security installation, maintenance and repair services. An additional acquisition of Precision Hardware was made in 2005. 2006 Stanley furthered its corporate assets in the security market by acquiring HSM Electronic Protection Systems after it had been spun off from Honeywell in compliance with pre-emptive Securities and Exchange Commission antitrust rulings. In the meantime, the company obtained security contracts as the primary contractor to secure three NASA spaceflight centers. Stanley Works also acquired Facom’. 2007 Late in the year, Stanley acquired OSI Security of Chula Vista, California, a provider of battery-operated wireless lock technology and supplies to government, education, and healthcare industries. 2008 Stanley acquired Beach Toolbox Industries, headquartered in Smith Falls, Ontario, Canada, then closed the plant. 2008 In June, Stanley announced the acquisition of Sonitrol, which provides security systems that use audio listening devices as the primary means of intrusion detection. Stanley also acquired Xmark Corporation, which provides radio frequency identification (RFID) solutions in healthcare environments. As of 2008, many of the Stanley Security Services divisions were being integrated under the HSM brand. 2009 On November 2, Stanley announced a merger with Black & Decker. The merger was completed on March 12, 2010. 2010 In July, the company announced the acquisition of CRC-Evans Pipeline International. CRC-Evans provides total project support for pipeline construction contractors with automatic welding and other pipeline construction specific equipment and personnel. 2011 On September 9, the acquisition of Niscayah was complete. 2012 On January 1, the acquisition of Lista North America, headquartered in Holliston, Massachusetts, was completed. 2012 On June 5, the acquisition of AeroScout, Inc., headquartered in Redwood City, California, was completed.